The best brownie I have ever had to date was from a nondescript stand at the Pleasantville Farmers Market on the afternoon of July 14, 2012. It was a gluten-free baked goods stand, which was probably why I paid it no heed the first time I made a round. I only returned because I was hungry and they had samples of brownies. I sampled, then I bought one. It was delicious, it was moist, and just the perfect balance of cakey and fudgy. It wasn’t sweet, but full of chocolate flavor. Perhaps I was just that hungry, but for whatever reason it has stuck in my head. Lately there has been a huge gluten free movement in the baking world. Every day it seems a new bakery specializing in Gluten-free goods has been popping up in every town. Admittedly I thumbed my nose at this. Have we become so picky with our food that we were all self proclaiming ourselves to be intolerant to gluten? I understood the demand from those who really were intolerant to gluten, but was this another one of those vegan movements? I’ve had baked goods that were vegan, and I was not impressed (and still am not). Over time I have become much more aware of how certain foods make me feel. I have developed a bit of a lactose intolerance that seems to be getting worse as I get older (no more milkshakes, but I can still have a good small cup of ice cream). I blame my Chinese heritage, since we are all pretty much lactose intolerant. As for gluten, over time I have become very aware of how I feel after eating certain foods, like pasta. While I still eat foods chock full of gluten (nothing comes between me and my baked goods), I definitely cannot eat a big bowl of pasta anymore. However this doesn’t mean I am on the gluten free bandwagon quite yet. But it doesn’t hurt to give it a whirl. Lately I’ve been hearing a lot about this gluten free flour made by a company called Cup 4 Cup. Supposedly you can substitute this flour to normal all purpose flour cup for cup (hence the name?). Seemed easy. To have a bag of flour already gluten free would save me from searching the internet for specialty flours to play with (and mess with ratios to boot). I’ve heard about it, but didn’t really know where to find it. Then, I happen to be in a Williams Sonoma the other day, and low and behold, there it was on the shelf for a whopping price of $20 for a 3lb bag. That’s expensive. Then I looked at a brownie mix that uses this flour (just to try it), and that was also $20. Ummm…why not just get the bag of flour and make my own brownies? Done. I used a recipe from Alton Brown’s I’m Here for More Food cookbook for the brownies. 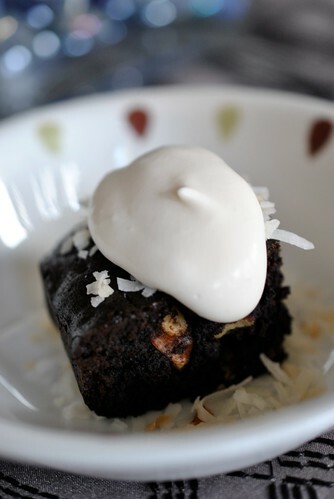 It was a basic brownie recipe except he uses an electric mixer with a whisk attachment to mix everything together. Odd. Then the directions were all off, and forgot to include when to add in the butter. Even more odd. But here is basically what I did. 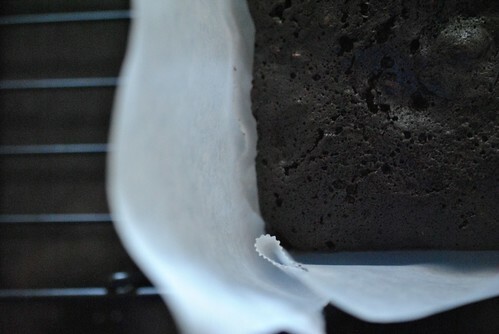 First preheat the oven to 350 degF and line an 8×8 pan with a parchment paper sling. In a bowl combine 3.5 oz (2/3 cup) of gluten free flour (or regular all purpose flour) + 4 oz (1 1/3 cup) cocoa powder (I used a double dutch dark cocoa from King Arthur Flour) + 1/2 teaspoon kosher salt. Melt two sticks of unsalted butter and allow to cool slightly. With the mixer and the whisk attachment beat 4 eggs until light. 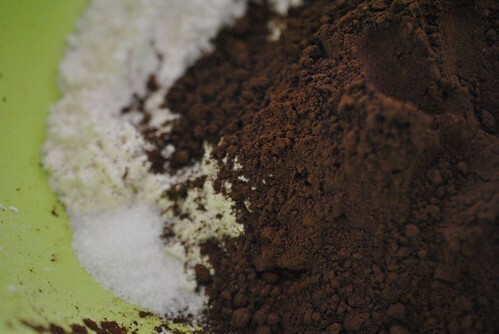 Add 2 teaspoons of vanilla extract then 1/2 cup of brown sugar and 1/2 cup of sugar and beat a little more. Then take the bowl out of the mixer and slowly add in the melted butter and give it a good mix. 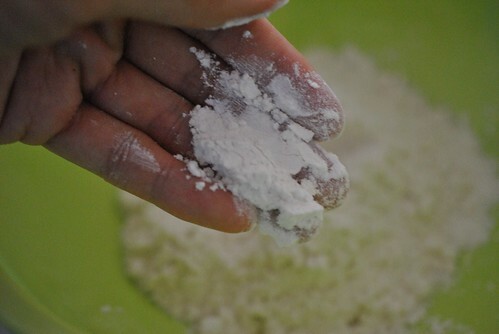 Add in the dry ingredients into the wet and mix (but don’t over do it) until combined. Add in a cup of walnuts if you want (I toasted up some walnuts). Then pour into the prepped pan and put into the oven for about 55 minutes until done. Cool on a wire rack, out of the pan. Once it’s completely cooled, dig in! 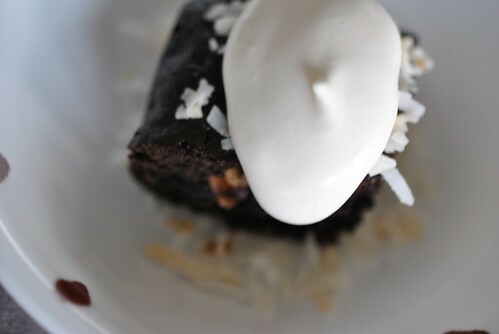 I served mine with some toasted coconut flakes and softly whipped cream. It was pretty good. The double dutch dark cocoa made it more of a dark chocolate brownie, and the sweetness level was perfect. However I may have over mixed and over baked a bit because it came out a bit more crumbly and drier than I would have liked. It most likely was a function of the baking time rather than the flour. I’ll have to try this recipe again with regular all purpose flour to see if the flour itself made a difference. 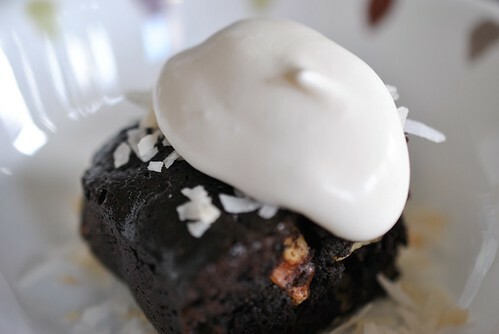 This entry was posted in Dessert, Uncategorized and tagged brownies, double Dutch dark cocoa, Gluten free. Bookmark the permalink.